Matt Blankenship, MD found his fascination with medicine and patient care at a young age, growing up as the son of a urologist. He watched his father with eager interest as he cared for his patients and the community around him. Dr. Blankenship wanted the same for his career. He chose the field of gastroenterology because it offered him a multifaceted experience in the practice of medicine—plenty of time with patients, but also a nice balance between procedures and clinic time. His pursuit of medicine began at the Univeristy of Oklahoma College of Medicine, where he earned his Medical Doctorate, as well as pursued his residency in Internal Medicine and fellowship in Gastroenterology. During his time at the University of Oklahoma, Dr. Blankenship achieved admission to Alpha Omega Alpha, an esteemed national medical honor society. 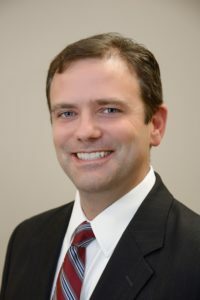 Dr. Blankenship is board certified in gastroenterology, with special focuses on colon cancer prevention, reflux disease, inflammatory bowel disease (IBD), and irritable bowel syndrome (IBS). In his spare time, Dr. Blankenship enjoys playing basketball—mostly pick-up games, these days—and spending time with his kids. He also has an affinity for history and literature, an attraction that began in his early years of college as an English major.